This hidden gem was my favorite place, hands down, on our family vacation to Ireland. You will find rugged beauty, prehistoric sights, quaint towns and peace on the Dingle Peninsula. Here is all you need to know for your Dingle Ireland Trip, including Dingle Hotels, Bed and Breakfasts and sights to see. Located in a panoramic setting overlooking Dingle Bay, Waters Edge House provides five star accommodations. Waters Edge House is the sister property to Emlagh House which is renowned for its luxurious accommodation. 3 bedroom apartment sleeps six adults in a master king- size suite, a queen suize suite, one twin suite each with their own private bathrooms. The dining area sits overlooking the Bay with endless vistas of the sea and mountains. Architect designed split level 3 bedroom cottage by the sea with stunning views of Ventry Bay And Ventry Beach. Private access to the sea via garden. Three bedroomed cottage with main bedroom en suite.Everything supplied.Fully centrally heated with open fireplace. 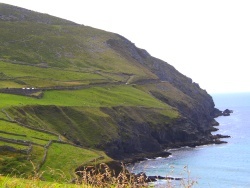 There are only a couple Dingle Ireland Hotels, but plenty of Bed and Breakfasts, which are a great way to experience Irish culture....and the delicious, filling Irish breakfasts! Brenners Hotel - The town's oldest hotel is a classic with old world charm and a lovely rooms. Moriarty's Farmhouse B&B in Ventry 5 miles west of Dingle, is where we stayed. It is so peaceful and beautiful at this country house and the breakfast room is lovely.. There is great hiking nearby to some ogham stones with writing dating back to the 4th century. Harry Clarke stained glass windows in the former convent chapel at the Diseart Institute of Education and Celtic Culture. Twelve beautiful stained glass windows depict scenes from the life of Christ. There are lots of craft shops with woolen clothing, leather goods, art galleries and jewewlry, inlcuding Brian de Staic's Jewellery Workshop with its Celtic Jewelery. For a romantic getaway dinner, check out Global Village with a continental, formal feel or Charthouse an upscale gourmet restaurant. You will find good seafood at Out of the Blue or Doyles where you might try the specialty, lobster. 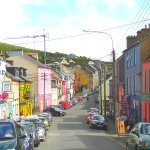 Other favorites in Dingle Ireland include Midi for pizza and Mediterranean food, Wild Banks Restaurant for the spinach and goat cheese roulade, Old Smokehouse or Murphy's Ice Cream Shop for the Guinness and chocolate chip ice cream! Stop in for a spell at The Dingle Pub or O'Flaherty's Pub for Irish music. If you have been to Dingle or when you return from your trip there, please share with my readers your favorite B&Bs, restaurants and sights here.